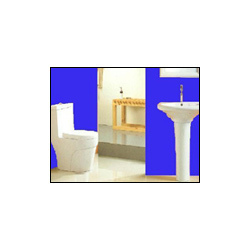 Leading Manufacturer of sanitary ware (euro single piece suit) and sanitary ware (opal single piece suit) from Mumbai. We are reckoned amongst the notorious manufacturer, exporter, trader and importer of a broad array of Sanitary Ware (Euro Single Piece Suit). This sanitary ware is acclaimed in the market due to its superior quality. Our offered sanitary ware is designed with the help of premium quality material and advanced tools under the guidance of excellent professionals. Customers can avail this sanitary ware from us on numerous sizes & designs according to their requirements. Over the years, we have been engaged in wholesaling a range of Sanitary Ware (Opal Single Piece Suit) to our clients. Owing to its unique characteristics, our range finds application in the bathrooms of hotels, houses, offices and other contemporary abodes. Furthermore, our range is available in custom-built form to suit the specific choice and preferences of the clients. Looking for “Single Piece Toilets”?